Born and raised in idyllic Door County, Wisconsin, Elsa Emerson has a unique childhood surrounded by the thespians who flock in every summer to perform plays in her father’s playhouse, the family’s converted barn. Elsa loves her father’s theater and the glamorous actors who populate it, indeed, she cannot imagine ever wanting to leave. Things change when Elsa was nine, after her sister Hildy’s affair with a philandering actor forever changes their family dynamic. By the time Elsa is seventeen, she is starring in her father’s plays and planning to flee Door County for Hollywood where, before long, she would go from blonde to brunette and from Elsa Emerson to Laura Lamont. 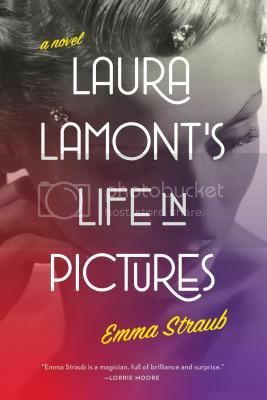 Laura Lamont’s Life in Pictures is a fascinating romp through old Hollywood. Straub beautifully captures the tension between the glamor and the uncertainty and loneliness. Laura’s first husband, the man who brings her to California from Wisconsin, goes from having a contract at a big studio to an addict in less time than one might expect, and Laura’s life also has setbacks that she never expected. Both Straub’s characters and her writing are charming, nearly irresistible. Laura Lamont’s Life in Pictures is a fabulous read, one you won’t want to put down. Highly recommended.